It's hard to believe that nearly 15 years have passed since Pixar was first introduced to the movie world via their groundbreaking film, Toy Story. Now, after a string of successful hits, including one of last year's best movies, Wall-E, the question is this: Does Pixar still have the magic that has captured the spirits and imaginations of children and adults alike after all these years? As if there were any doubt, the answer to that question is "yes." Up is one of the best movies of 2009. Up begins with young Carl (Ed Asner), an adventurer who looks up to famed explorer, Charles Muntz. One day, he meets Ellie, a fellow adventurer who dreams of traveling to South America, to a place called Paradise Falls, which he promises to take her to. Flash forward years later and the two are happily married. A montage takes us through their entire lives, ending with Ellie's death, leaving Carl sad and alone. Construction is taking place around Carl's house, but he refuses to leave it because of his fond memories of his life with Ellie. After a brief lapse in judgment, whacking a worker with his cane, he is forced into a retirement home. However, before that fateful day where he must leave, he ties thousands of balloons to his house, which take him off the ground and carry him away. Unfortunately, Russell (Jordan Nagai), a Wilderness Explorer hoping to grab his last badge for helping the elderly, has come along for the ride. It was difficult writing that plot synopsis because the reasoning behind Carl's adventure, which is the whole basis of the movie, deals with the passing of his wife, which is played out in only a few minutes through a brief montage. How can you possibly explain a montage? I won't even attempt, but I will say that it's one of the most beautiful, yet heartbreaking things you'll see all year. Some movies spend hours trying to get you to feel sadness at the tragedy that occurs at the end of a film. Up does it in minutes more effectively. One minute you're shining with joy at their marriage, the next sympathizing with them at the miscarriage of a child, then moved to tears at the passing of Ellie. In five minutes, I had already felt the plethora of emotions that other, lesser films hope to convey. It's here that you know you're watching something truly special. And that's only the first block of the movie. Up packs more imagination and heart into its first 30 minutes than anything I've seen so far this year. It's impossible not to gaze in awe at the unnumberable amount of balloons whisking this old man away for this huge adventure. It will take even the most jaded of film-goers and turn them into giddy little children, overjoyed at the wonders of its artistry and it will remind cinema lovers why they go to movies in the first place. Animation or not, Up is simply astonishing. Its story isn't just a mindless fairy tale for children either. It's about life and its intricacies, many of which we don't appreciate until they are taken away. Carl takes this trip to fulfill Ellie's dream of reaching Paradise Falls, but even while on this epic adventure, encountering things he's never encountered before, seeing majestic landscapes most only dream of, he realizes that it means nothing without his wife. He always knew of the tremendous love he held for her, but felt like he never fulfilled his promise of taking her on a grand adventure, but then he realizes that their life together was an adventure, the best they ever had. Carl is a lost, lonely man at the beginning of the film, but by the end, you feel like he's gotten a new lease on life, thankful for his time with his wife, but moving on, creating new relationships and living life to its fullest. As referenced by the promotional material, Up is Pixar's first 3D movie. Having seen this twice now, once in 2D and once in 3D, I've come to the conclusion that the 3D isn't needed. The problem with 3D is that the glasses are tinted, which makes the movie look less vibrant and colorful, and Up's animation is stellar, so the inhibiting glasses don't work to the film's advantage. What's more is that the 3D in Up is serviceable, but unneeded, seeing as how many of the film's scenes didn't utilize 3D, noted by my tendency to tilt my glasses off to see what the picture looked like without them. Regardless of how you see it, you'll be treated to a warmhearted, funny, touching and brilliant film that is practically guaranteed to move you to tears. I saw this movie for the first time in mid-April and was not allowed to discuss it until now. Walking out of it all that time ago, I knew I liked it, thinking a solid four out of five score, but after a month plus of reflection and sitting through it a second time, my mind free of analytical thinking, I've realized how special this movie is. Is it as good as Wall-E? No, but if you compare every animated movie to that, you're bound to be disappointed. As such, looking at this as a standalone film, it is spectacular, a real treat for anybody, regardless of age. 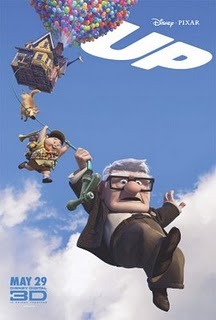 Up is a wonderful piece of entertainment and one of the best movies of 2009.